Big Finish has become increasingly keen to release box sets of adventures across its many ranges in recent years, often allowing for expansive tales- or at least significant portions of expansive tales- to unfold across many serials in a more deliberate and developed fashion. Yet while even the Fourth Doctor’s eight stories unfolded over two box sets in 2018, the eighth series of The Fourth Doctor Adventures is the first to present a significant interlinking arc as well as the first to present this timeless Doctor with a brand new audio companion in the form of Jane Slavin’s WPC Ann Kelso. Beginning with Andrew Smith’s ‘The Sinestran Kill,’ the Doctor traces an anomalous energy signature on twentieth century Earth, stumbling into an assassination attempt with far-reaching consequences. As gangland thugs try to murder an innocuous shopkeeper, this smaller-scale introduction to what gradually develops into a grandiose tale of witness protection, defection, and powerful alliances and shifting of power works wonderfully, allowing the would-be victim Tony Reynolds to develop naturally and emotionally alongside Ann who unwittingly finds herself witness to the plot on more grounded terms that she can understand. Of course, it’s not long before the Doctor arrives and completely turns Ann’s world upside down, but the knowledge the unimpressed DCI Neilson who used to work in special ops holds about UNIT and the Doctor helps allay any disconcerting sense of agitation as best as reasonably possible after she sees the TARDIS and what potential it holds within it. To her credit, though, she adapts to her wildly changing reality with deftness and proves more than capable of holding her own as the danger around her continues to escalate with her own life likewise hanging in the balance, and Slavin gives Ann a fitting combination of understanding and wonder that complements the character’s natural determination excellently. The somewhat lighter tone and fairly straightforward nature of this twisted gangster story also allows the specifics of the alien threat to resonate all the more effectively. While the title of the piece suggests that the mobster Sinestran race will be the focus as they seek to eliminate a former associate who has knowledge about the identities of higher-ups in a recently-formed alliance, even more intriguing is the presence of a member of a related race that exists as a nebulous gas and that hypnotises others to see whatever and act however it pleases. This is a frightening power that puts an entirely new spin on the attempted murder, and the interactions between the many aliens here only hint at the grander scheme in play and how dangerous these races truly are. 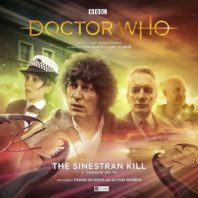 Though the resolution is quite rushed, ‘The Sinestran Kill’ wonderfully sets up what is to come with a familiar backdrop and narrative trajectory that allow the supporting cast and new companion to vividly develop. At the same time, Tom Baker is on top form as the commanding but certainly unconventional Fourth Doctor subtly steers events to ensure he has the upper hand when all truths are revealed. His ultimate actions are sure to have further ramifications down the line, but here they typify the breadth and effectiveness of the Fourth Doctor in a manner that seamlessly incorporates more modern elements as well. Again, this may not be the most profoundly resonant or mentally challenging tale, but it’s difficult to imagine a more polished and effective introduction to this new story arc and just how this particular unexplored chapter of the Doctor’s fourth incarnation will unfold as the bigger conspiracy at hand comes into focus. The bar has been set high and intrigue developed and maintained as Ann proves her mettle, all that can be asked of this particular introductory tale.